This slyly funny, moving novel about a blue-collar town in upstate New York—and in the life of Sully, of one of its unluckiest citizens, who has been doing the wrong thing triumphantly for fifty years—is a classic American story. Divorced from his own wife and carrying on halfheartedly with another man's, saddled with a bum knee and friends who make enemies redundant, Sully now has one new problem to cope with: a long-estranged son who is in imminent danger of following in his father's footsteps. 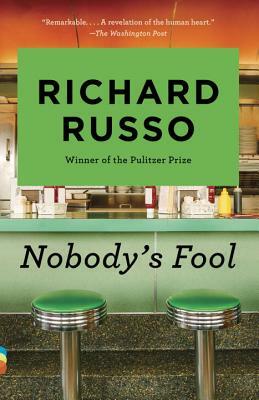 With its uproarious humor and a heart that embraces humanity's follies as well as its triumphs, Nobody's Fool, from Pulitzer Prize-winning author, Richard Russo, is storytelling at its most generous. Nobody’s Fool was made into a movie starring Paul Newman, Bruce Willis, Jessica Tandy, and Melody Griffith. Richard Russo is the author of eight novels; two collections of stories; and Elsewhere, a memoir. In 2002 he received the Pulitzer Prize for Empire Falls, which like Nobody’s Fool was adapted to film, in a multiple-award-winning HBO miniseries.